Broadband shoppers must receive better information about speeds, before they commit to a contract, under new protections announced by Ofcom today. Alex Neill, Which? Managing Director of Home Products and Services, said: “Consumers have told us that they feel confused about the broadband speeds they are likely to get and the service they pay for, so further steps to help inform customers and empower them to walk away without facing a penalty are welcome. Today’s measures are part of a series of initiatives to give people more confidence when choosing their broadband supplier. Other actions Ofcom is taking on behalf of consumers include revealing the best and worst providers for service quality, automatic compensation when things go wrong, and strengthening the general rules all providers must follow. Ofcom published ‘mystery shopping’ research last year, testing providers’ compliance with the current codes. Some of the findings were positive: for example, almost all telephone calls led to a speed estimate being given. However, there was significant room for improvement in areas such as providing information on broadband speeds without being prompted. We have recently required the code’s signatories to set out the steps they are taking to ensure better information is provided to customers. Ofcom will also monitor compliance with the new requirements announced today, and we intend to publish a report on companies’ performance the year after implementation. Average download speeds for residential customers are 34.6Mbit/s during the 8-10pm peak period, compared to average maximum speeds of 39.1Mbit/s. Source: Ofcom’s UK Home Broadband Performance report. Ofcom introduced the existing residential code in 2008, and a code for business services in 2016. All of the UK’s largest providers have signed up to both codes of practice. We worked with providers to examine how we could improve the codes to benefit consumers, and consulted on today’s proposed changes in October 2017.
have fair and transparent debt-collection and disconnection practices in place. Ofcom has been working closely with the Advertising Standards Authority and Committees of Advertising Practice (CAP) to improve the way broadband is advertised, to prevent people from being misled. 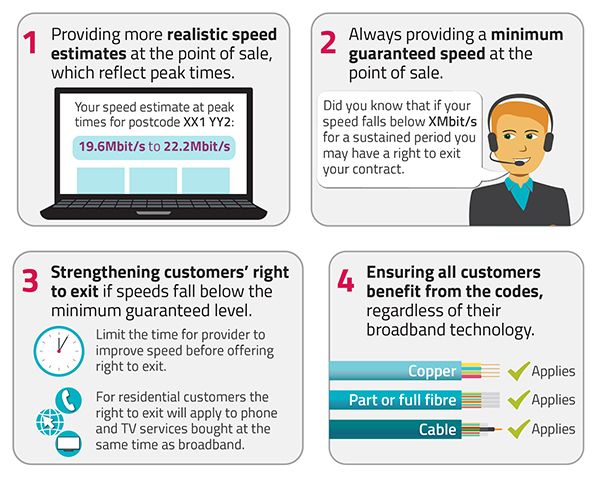 We welcome CAP’s recent announcement of major changes to broadband speed claims in ads.